We manufacture and supply polyamide thermally broken commercial shopfronts, shop entrance doors and window walling in a extensive range of colours. Unlike most aluminium shopfront systems it can be painted in any single or dual colour, i.e. grey outside and white inside. 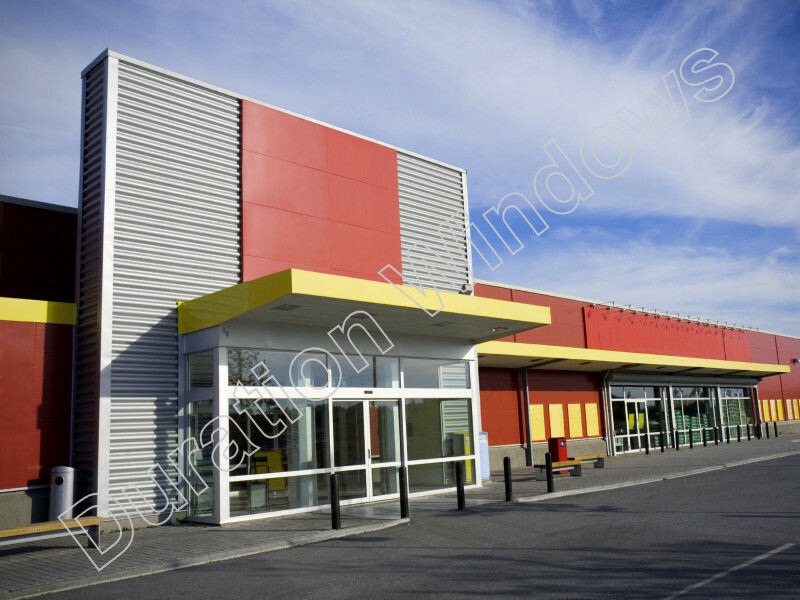 Doors for your shopfront can be manufactured for manual or automatic opening, though we do not supply the gearing. Choose from options for your entrance doors, for hardware, security and operation to suit your needs and your budget. Our high performance shop screen system is highly thermally efficient and can produce low rise window walling up to 3 metres high. It can also be integrated with other products from our range to create a number of opening light options. High Weather performance, tested in accordance with British Standards and exceeds a wind resistance of 2000 Pa.
Can comply with Doc. L for thermal transmittance, please provide sizes for U value calculations. Shop Window U values as low as 1.4 W/m²K and Shop Door U values as Low as 1.7 W/m²K.